I just went through my box of oldest letters. 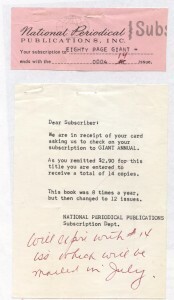 Fifty years ago I wrote a lot to the editors of DC Comics, which at the time was still hiding under the name National Periodical Publications, Inc. 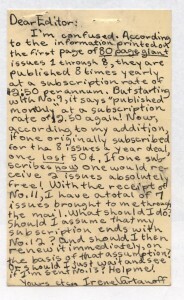 I also wrote to the subscription department. 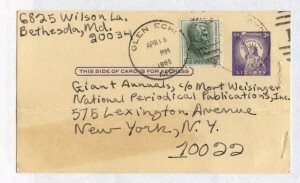 As was their habit back then, often my initial postcard was stapled to their response. Thus, despite not having a technologically practical way to capture what I wrote as a teenager to that big New York comics company (you can’t run carbon paper under a postcard in a typewriter or if you’re using a fountain pen), I have some souvenirs of my amazing outpourings. 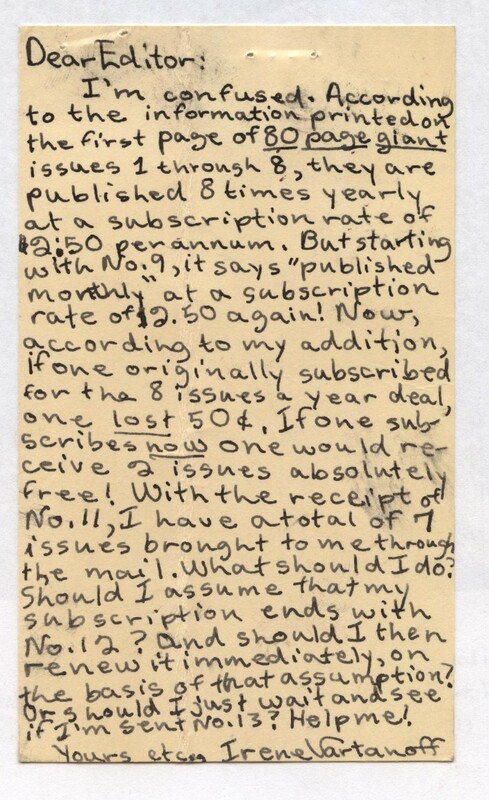 Imagine a handwritten postcard with every space on it taken up by an argument about the price and frequency of a subscription that included an 80-page Giant. Over fifty cents! If I hadn’t already put the box back into the most inaccessible corner of my closet, I’d scan it just for the absurdity. (See my note below.) Didn’t I have anything better to do with my time? Actually, no, I didn’t. I graduated a year early from high school, and got a part-time public library job and went part time to what was then called junior college. And I read a lot of books and comic books. 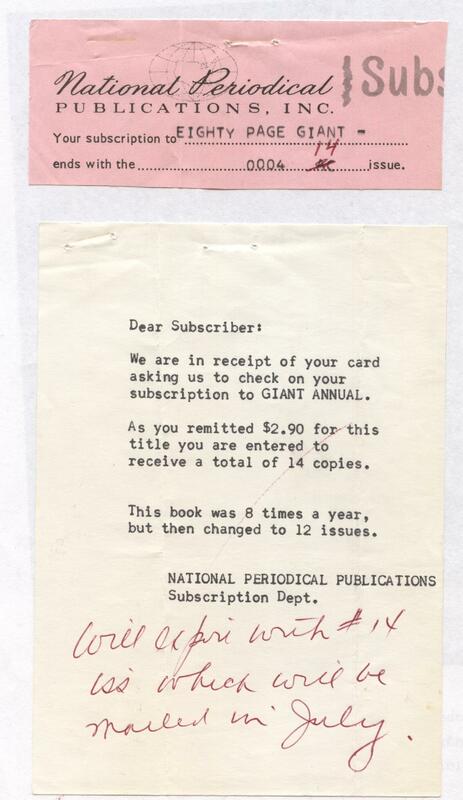 I had acres of time left over to write letters of comment to comic books, and to harass subscription department clerical workers about the minutiae of their offers. From these, somehow, the editors decided I was someone to encourage. I shake my head to this day at the unlikelihood of it. Maybe their own daughters showed no enthusiasm for what they produced. By contrast, mine was palpable. 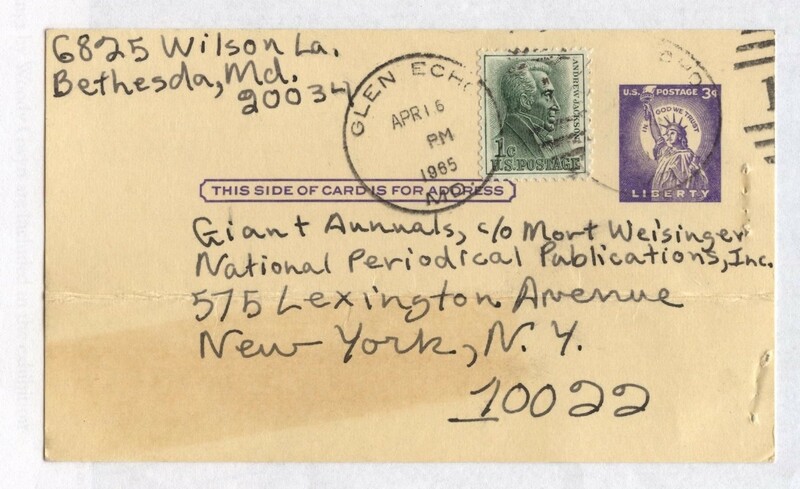 Fifty years later, I still have every note written to me by anyone from National Periodical Publications, Inc., and every envelope in which those notes came. I treasured each one of them at the time as a connection to the world of all my colorful fantasy longings. They also were a connection to the adult world, totems that proved I was on the right track heading for adulthood because I could actually get an adult to respond to me seriously instead of brushing me off. I probably was wrong about that; I was first and foremost a customer, so of course they replied politely. It was a more polite era, as well. But what a thrill. I suppose the current equivalent would be to write a piece of fan mail to a movie producer and get a personal reply. I treasure those notes, because I treasure my few memories of who I was fifty years ago. It’s an unimaginable distance ago in time and living. EDITED TO ADD: Finally opened the closet again and here’s the postcard I sent April 16, 1965. Stapled to it were two form notes from the subscription department. I sent my postcard at a time when I was still in high school but deathly bored and determined to be done with it soon. That’s a tale for another day. Mort Weisinger was the editor of all the Superman titles.